It seems like everyone in the health and wellness community is talking about freekeh, and for good reason! Just the other day, Momma FitMenCook, aka my mother, asked me about freekeh because her friends were discussing it at the gym. Freekeh is actually quite common in Middle Eastern cuisine and thanks to promoters like Oprah and Dr. Oz, freekeh is making its way into more households as a delicious and healthy alternative to starchy rice. It’s not rice, though! It is made from green wheat that has been roasted extensively. It packs quite a punch when it comes to nutrition as well. It has four times the fiber content of brown rice, is fairly low in carbohydrates, is high in protein and has been known to help with digestive health. It also has a low glycemic index which makes it a popular choice among diabetics. I highly recommend it if brown rice is driving you crazy and you now find it uninspiring. I enjoy freekeh for all of its nutritional benefits and because of the taste. It’s pretty versatile so it can be either sweet or savory – all you need is a little creativity to create the perfect meal to satisfy your taste buds and feed those muscles! So, I put my own spin on “tabbouleh” by using freekeh instead of bulgur and tossing in some avocado and shrimp to boost the caloric and macronutrient value of the meal. Boom! Bring a pot of water to boil, add the uncooked freekeh, reduce heat, cover and cook for about 25 minutes or until desired firmness. For a “nutty” texture, cook for less time, around 15 minutes. You can also use a rice cooker to prepare the freekeh. While the freekeh is cooking, chop your veggies into small “pinky finger”-size pieces. 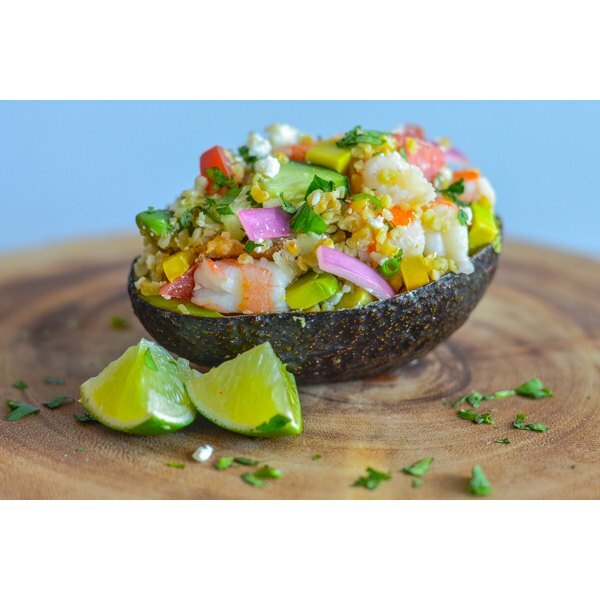 Slice and chop the avocado last and drizzle with fresh lemon or lime juice to prevent it from browning. Lastly, chop the shrimp separately into small pieces and set aside. Allow the freekeh to cool to room temperature and then toss in all of your sliced and chopped veggies. Stir slowly with a wooden spoon or spatula. Season with a pinch sea salt, and then with pepper and cumin to taste. Then, add fresh lime juice to taste. Lastly, add the shrimp and feta cheese; mix.